There has been an issue discovered when installing on the AIX machine. This is a known issue with respect to running an Installshield Multi-Platform installer on an AIX 5.3 machine. SIGSEGV received at 0x362220e4 in /opt/JDEdwards/Install/ismp001/libaixppk.so. Processing terminated. The management of an EnterpriseOne Enterprise Server is handled on all supported platforms. This tips section will speak to the iSeries specific Change Component process. As most know, the process for doing anything on the iSeries (AS400) machine is quite different than any other platform. I will talk to the steps (commands) that are used during the process of changing out a tools release using Server Manager. Now, what happens during the processing to change out an iSeries EnterpriseOne Enterprise Server's tools code? First thing to note is that logging is fairly detailed as to the actual commands that are issued to the iSeries. Additionally, the return messages, even when successful, are logged to the agents log file. This is good for all troubleshooting. Second thing to note, as with any platform, the processing of changing out a tools release does a backup of the release being changed out as a first step into a temporary folder. This is for rollback purposes. If a step in the process of changing out the tools release fails a rollback will be executed. Now that you have these notes in the back of your mind, we can talk about the steps in the process. First in processing is the backup itself. A save file is created for both the QSYS and IFS file system related to the EnterpriseOne code base, CRTSAVF commands. Next, if a printqueue directory exists in the IFS, a temp directory is created (MKDIR command) and the contents "moved" to the temp dir (MOV command). The reason for the quotes around the moved is based on the fact that the contents are not copied as this operation could take very long if the printqueue directory is large. The iSeries can "move" ifs objects much more efficiently than copy them. Next, a temp directory is created for the ini directory (MKDIR) and the ini file is "moved" to the temp directory just created (MOV command). Moved for consistency with the printqueue more than anything. Next, the actual save of the system library (i.e. - E812SYS) and the ifs directory (i.e. - E812SYS) is executed (SAVLIB command). Next each of the save files is copied into the IFS jde_home\targets\\ using the copy stream file command (CPYTOSTMF command). Now the backup of the existing system is complete. Second in processing is replacing the old with the new. First we extract the software components contents into a temp directory. The contents that are important to Server Manager are scf-manifest.xml, system(SAVF) and krnlspec(SAVF). Next, the system library (E812SYS) is deleted (DLTLIB command). An important note here is that if any jobs have a lock on this library at this time, the DLTLIB will fail and the change will throw an Exception. So, make sure no locks are present before beginning this process. Next, a save file for the system library is created in a job QTEMP library (CRTSAVF command). Next, the extracted save file is copied into the newly created save file for the system library using copy from stream file (CPYFROMSTMF commands). Now we have the new qsys system save file that can be restored. Next, the system libarary is restored (RSTLIB command). A note here is that the library the system is restored into is the same name as the original library. Next, the creation of a subsystem (SBSD) is executed (CRTOWSBS command). Next, changing the data area BUILD_VER (DTAARA) in the system library is necessary (CHGDTAARA command). This matches the restored library name with the data area information. Next, delete the IFS E812sys directory (Java IFS file system utilities) . Next, a save file for the system folder is created in a job QTEMP library (CRTSAVF command). Next, the extracted save file is copied into the newly created save file for the system folder using copy from stream file (CPYFROMSTMF commands). Now we have the new ifs folder save file that can be restored. Next, the ifs folder (i.e. - E812SYS) folder is created. Next, the ifs folder changes owner to ONEWORLD (CHGOWN command). Next, the ifs folder is restored (RST command). Next, is the move of the printqueue and ini folders and contents. First make a directory for printqueue (MKDIR command). Move the contents into the new directory from the backup location (MOV command). Then change ownership to ONEWORLD (CHGOWN command). Second make a directory for ini (MKDIR command). Move the contents from the backup directory into the new directory, should just be jde.ini (MOV command). Then change ownership to ONEWORLD (CHGOWN command). Next, get the version value from the PTF.LOG file and set it for the instance. This is so we know the version of EnterpriseOne based on the value in this file. So, if all the above steps complete successfully, we now have a new version of the EnterpriseOne Enterprise Server ready to run. Otherwise, at any point in the process that fails the backup system will be restored based on where in the process the failure occurs. Hence, there is as much level of commitment control going on as possible. Basically, the IFS and QSYS steps are tracked and then if all these are past then a full rollback should be attempted. I will not go through all possble scenarios with the rollback, but you will see the commands run to execute the rollback the same as the above steps. Processing the iSeries EnterpriseOne Enterprise Server changeComponent is quite different than any other platforms Enterprise server, but the model is the same. Meaning that Server Manager will use common models for install, change and uninstall throughout the processing of all the EnterpriseOne server types. We have recently taken a few instances where the Server Manager process stops when you sign in and out of the Server Manager machine, or you connect remotely to the Server Manager machine and then disconnect from it. This issue has been SARd under 8688882. This is actually a known Oracle issue with OC4J as documented in Metalink document 245609.1. For Server Manager, there are two methods to correct this issue. The first method is recommended since it does not involve editing the registry manually and it also ensures that the Server Manager install script gets modified so if it is rerun in the future, it will automatically add the service correctly. Method 2, however, is likely the quickest work around. Note the addition of -Xrs. This change REQUIRES that -Xrs come just after -Xmx512m. 2) Ensure that the Server Manager service is currently stopped. 3) Open a command prompt, and go to your JDE_HOME\bin directory. where PASSWORD is your original jde_admin password from the server manager installation. 5) Start the service. It should now remain running after you log out. This change REQUIRES that -Xrs come just after -Xmx512m. 3) Start the service. It should now remain running after you log out. You get the idea. The agent does most of the work. If anything goes wrong during one of these items, or your just an inquisitive person, the place you'll want to look to see what's going on are the agent's log files. Before we dig too far into the log files themselves let's get an understanding of the logging system used. Server Manager makes use of the standard java logging framework. This framework is different than the logging engine used by most other E1 software components which are based on the jdelog.properties configuration file. LevelDescriptionSEVEREA critical error has occurred from the perspective of the agent. Critical errors are non-recoverable errors and require immediate attention. An example would be a critical problem when initializing the agent that would prevent it from starting or functioning properly.WARNINGDenotes an abnormal or unexpected result occurred that is recoverable, from the perspective of the agent. An example would include a failure while changing the tools release of an E1 server. It is a significant problem, however, the agent will recover so is considered a warning.INFODenotes informative messages providing contextual information as to what the agent is doing. An E1 server that is started using SM would have a log message indicating so at the INFO level.CONFIGNot commonly used in SM, a message at the configuration level is simply a means for logging information particular to that installation, such as the platform of the server.FINEA lower level message still intended as human readable that provides insight into what the agent is doing. This can be thought of as a standard "debug" message.FINERAn even lower level trace of debug message. Messages are classified at this level rather than FINE if they are very frequently occurring and either less likely to be of interest. FINESTThe lowest level of logging. These messages may be very frequent, verbose, or cryptic and may only be meaningful to Oracle development. The division between SEVERE and WARNING is a little muddy. You may see messages that appear as SEVERE that really should be qualified as WARNING based on the above descriptions, and less frequently there may be a WARNING message that should have been classified as SEVERE. The default logging level for the agent is FINE, which should be fine for nearly all troubleshooting needs. The agent is much less verbose than some of the other E1 products. Keeping the logging level at FINE, FINER, or even FINEST will have negligible impact on performance. There just aren't that many messages emitted to cause a problem. The agent log files are located in the directory <agent_install>logs, where <agent_install> refers to the install location supplied during the managed home installer. The log files are named e1agent_#.log. The logging mechanism will automatically split log files into approximately 10 MB chunks, and up ten log files will be retained. That means the most amount of disk space needed for the agent logs is 100 MB. The '#' in the log name is the index of the log file with zero being the most recent and nine being the oldest. When the current log file, e1agent_0.log, reaches approximately 10 MB the last chunk (e1agent_9.log) will be deleted and all the log files will be renamed with the index incremented. The e1agent_0.log is now e1agent_1.log and a new e1agent_0.log file will be created. Another file, 'e1agent_0.log.lck' may also be present. This file is created by Java as a lock file and may be ignored. The log files for the agent may be viewed directly through the management console directly. From the management dashboard (start page) select the managed home of interest. At the bottom of the page for the selected managed home is a log files section. Selecting a log file will transfer the log from the remote machine to the management console so it may be viewed using the integrated log viewer, as shown below. Each log message consists of two or more lines. The first line contains the timestamp, originating java class, and the name of the current method from which the message was written. The second line (or multiple lines) contains the actual log message. The default level for agent logging is FINE, which is appropriate for most occasions. It may be desirable to change the level to FINER or FINEST to troubleshoot an issue, or move it to a higher level, such as INFO, for some reason. If the agent is running and connected to a management console you may change the level directly from the console. Located on the left hand side of the page for the management agent is a section entitled 'Managed Home Details'. In there is a dropdown for 'Agent Log Level'. The current value will be shown. To change the level simply select the desired log level from the drop down list. The change will immediately take effect. Changing the log level through this dropdown is not permanent; when the agent is restarted it will resume logging at the FINE level. If you wish to permanently change the logging level, or you will to set the level to something other than FINER during agent startup, you may add the following line to the <agent_install>/config/agent.properties file. You may use any of the log levels mentioned in the table above, or OFF to prevent all logging. I do not recommend permanently keeping the log level at OFF, SEVERE, WARNING, CONFIG, or INFO. You never know when you may need the additional information provided by the FINE level. The agent will automatically remove old log files so there should be no concern of log files filling a disk. The E1 enterprise server and E1 HTML server all contain variants of the management agent. In the embedded form the logging messages generated by the management agent are not typically logged. It may be desired to enable the same logging for the embedded management agents. To do so simply add the following line to the <agent_install>/config/agent.properties file. After adding this line and restarting the E1 managed instance series of log files will appear in the <agent_install>/logs directory. The filename of the log files will be the instance name of the E1 server. It is very rare to need to enable this logging; that said it may be useful to troubleshoot why the embedded agents may not be communicating with the management console. This form of logging is not available to an E1 web server if it is deployed to a federated (e.g. network deployment) node in IBM WebSphere. Stack Traces: some log messages may contain stack traces. This information is useful for identifying the source of the message. A stack trace is not always indicative of a problem. The level of the message is much more indicative. Stack traces for INFO, FINE, FINER, or FINEST messages are included to provide more information and is not an error. Part 2 in this series about the Server Manager logs will be a short one and is all about the log files created when installing a management agent. I've already posted an article Troubleshooting Agent Communications that covers in detail the troubleshooting process for a successfully installed agent that refuses to communicate and appear in the management console. This article will simply look at the installation logs created by the management agent installer. In a future post I'll get to the good stuff -- the log files created by a running management agent. That will be where you'll wan to look for troubleshooting most issues in Server Manager. InstallShield installer creates a temporary directory named something like 'ismp01' underneath the system temporary directory. On UNIX based platforms and the iSeries this temporary location is usually /tmp and on Windows the temporary directory is identified by the %TMP% environment variable, usually Documents and SettingsusernameLocal Settingstemp. After the installation is complete the smha_is_install.log is copied to the installation location supplied during the installation wizard. The installer itself is actually quite dumb. The installer program does not actually contain any of the components it will install; instead it obtains the components to install directly from the management console. This is the reason the management console must be running at the time the management agent is installed. The list of components to be downloaded are saved as a text file to <agent_install>/List.txt. The contents of the file will vary slightly for each platform. The next step is to download and extract the components contained within. The remaining steps performed by the installer are related to setting some permissions on the installed JDK (UNIX based platforms) and to start the management console. On windows you would see an additional step to invoke the installManagementAgent.bat script to create the Windows service for the managed home agent. The final step is to remove the List.txt file downloaded earlier and start up the managed home agent. Pretty simple, eh? Server Manager has log files. A lot of 'em in fact. There, I said it. So where do you go when something in SM isn't working just right? We spent considerable time attempting to log often and use meaningful messages within SM. That said it is a distributed architecture with components contained on the console machine, agents installed on remote machines, and more agents built into the E1 products themselves. This post will help you identify which logs you should be looking at, where they are, how to configure them, and what to look for. For the sake of being able to finish the article eventually I'll just focus on the SM logs. Throughout this post I'll be referring to some common paths. <console_install> - Refers to the location supplied during the installation of the management console. We begin with looking at the log files generated during the installation of the management console. These can be helpful if there are problems installing the management console application. Once the console is successfully installed and you are able to sign-in to the web application these logs are no longer relevant for any purpose and may be removed, if desired. The management console is installed using an InstallShield based installer. This installer is responsible for creating the <console_install> directory, extracting all the component files that make up SM, configuring the integrated J2EE server, and deploying the management console web application. The primary log created by the installer is located in <console_install>logssmmc_install.log. This is the first place you should look if you are having problems installing the management console. This log will probably go down as the most cryptic of the log files to analyze but somewhere in there is good information. One thing to note is if something goes wrong during the installation the installer will roll back the changes already made. This may result in error messages and other possibly confusing messages in the log file. In the case of a failed installation you want to find the first thing that went wrong in the log file before it started rolling back the installation. At the same time two new log files will appear in <console_install>logs: jazn_stdout.log and jazn_stderr.log. These are the stdout and stderr output from running commands contained in the jazn.jar java application delivered with the J2EE container. The stderr file should be empty. Any content in the file is indicative of an error and will cause the installation to fail. If the jazn_stderr.log file is not empty you should investigate the cause of any errors detailed within. (Jul 31, 2007 12:40:17 PM), Install, com.installshield.scfmc.event.InstallScript, msg1, Beginning the onInstalledOc4jExecComp method. [2008-01-24 14:50:42] [info] Procrun finished. The SM Management Console [D:servermanagerdemosystem] - SCFMngmtConsole4 service is starting. The SM Management Console [D:servermanagerdemosystem] - SCFMngmtConsole4 service was started successfully. (Jul 31, 2007 12:42:00 PM), Install, com.installshield.scfmc.event.InstallScript, msg1, Deployment succeeded for MC. 07/07/31 12:41:33 Notification ==>Application Deployer for ManagementConsole STARTS. (Jul 31, 2007 12:42:00 PM), Install, com.oracle.e1.install.common.ISMP.product.LogFileErrorCheck, msg1, Beginning stderr log checks. (Jul 31, 2007 12:42:00 PM), Install, com.oracle.e1.install.common.ISMP.product.LogFileErrorCheck, msg1, No errors in the stderr logs, continuing the installation. In case you forgot the information you entered, such as the HTTP port to use for the management console, a readme.txt file is created in the <console_install> directory. After creating the readme.txt file the installation is essentially complete. Now that we have the management console installed it's time to start installing some management agents, and looking at their log files. Most of my posts thus far have been about installation, troubleshooting, and other server manager basics. Today begins a series of posts outlining the new or enhanced capabilities provided by SM. Monitors are the mechanism by which administrators can be alerted through e-mail when an event of interest occurs. Much of this functionality is a direct carryover from that provided by the SAW SMC infrastructure in previous tools releases with some significant enhancements to boot. As you may be aware by now Server Manager is a complete replacement for SAW and SMC. Among the other benefits, such as deployment and configuration management, we wanted to enhance and make easier to use the functionality provided by the SAW application. We also changed the mechanism by which the events of interest are obtained. Beginning with 8.97 our server products contain an embedded variant of the management agent that provides server manager with the runtime information about the servers. Using this mechanism to obtain events provided two primary benefits: many of the events are reported to SM immediately upon occuring and events can be obtained from clustered or multi-JVM configurations for our web based products. Currently monitoring is supported for our enterprise server and HTML server products only. To get started select the monitors link from the quicklinks section. Note you must be signed into the management console as the jde_admin user or another user that as been granted the 'monitorConfig' permission to make changes to the monitoring configuration. The first step is to configure the SMTP mail server that will be used by server manager to send emails. Simply supply the mail server name, TCP/IP port to use, and sender email to use as the 'from' address. Some SMTP servers may require the sender email be from the same domain the mail server is configured to use. Note: SMTP servers that require authentication to send emails is not currently supported. After making any changes you may supply an email address to test the settings. Server Manager will send an email to the supplied address to ensure the mail server configuration is correct. The next step is to create a new monitor. You may have as many monitors as you wish. For example you may wish to create multiple monitors that listen for different events and each have different email recipients. Enter a name for the new monitor and select the 'Create' button. You will be redirected to a page used to configure the newly created monitor. The first option in the general settings controls how often the monitor should poll for events. Some events will be detected immediately; when they occur a notification is sent to the management console and then to each running monitor. If this event is enabled for a particular monitor an email will be sent immediately. Other events are polled on a periodic basis. For example checking the free disk space on an enterprise server occurs on this period poll. You can change the frequency in which the monitor will check for these events. Checking for monitored events is a low impact activity. That said if you have a large number of monitors it may be advisable to increase this interval from the default of 30 seconds. Secondly you may configure whether this monitor should be automatically started when the management console application is started. Regardless of this selection an authorized user may start and stop monitors at any time using the previous page. The next step involves selecting the managed instances that this monitor should observe. Simply move the desired instances from the available options list to the selected options. Note that any changes made here on a running monitor will take effect immediately; the monitor need not be restarted. Now that we have selected which managed instances we should monitor we now need to select which events we wish to observe. You do so by simply selecting the events of interest in the next section of the page. Each event has a help box next to it describing what the event is and when it may occur. Some events may have threshold values that allow you to define a limit that, once reached, will trigger an email notification. The example below shows the limits for simultaneous users. Once a threshold limit is reached on an enabled event a email notification will be sent. Notifications will not be resent unless the threshold goes higher. Consider the simultaneous users event. If we set the threshold to 50 we would receive a notification once 50 users are on at the same time. If two users sign off and two new users sign back on we are back at 50 simultaneous users. An email will not be sent; an email for 50 users has already been sent. If another user signs on, so we are at 51 sessions, and email will be sent; we have gone higher then the highest threshold reached. I won't go into what all the events are in this post; they are documented with online help within the application. For a particular monitor you may specify which hours in the day and which days of the week email notifications should be sent. This may be helpful for those who administer in shifts. Those interested in events on weekdays may be different then those interested in weekend events, for example. When you create a new monitor the default will be to enable notifications for all hours of all days. You can change this by modifying the times for each day using 24 hour notation. To disable events for an entire day simply set the start time and end time to both be 00:00. The management console will use the clock and time zone information provided by the JVM on which it runs. That is the times should be considered to be the times as known to the management console machine. Finally we specify the email recipients that should receive notifications. You may add as many recipients as you wish. Any changes made to this list will take effect immediately; you need not restart the monitor. Emails are sent individually to each recipient defined for a monitor using the from address configured previously. The subject and content of the email will contain details of the event. The mail format is plain text and is suitable for email, pager, and SMS mailboxes. If an email could not be sent for any reason the failure will be recorded in the monitor's history, as discussed below. Server Manager maintains a history for each monitor. Each start of a monitor will be listed in the monitor history. You may view the history of a particular monitor to see all the events that occurred and the emails sent by clicking the appropriate icon in the grid row. Each event that occurred will be listed along with the same type if information that was contained in the email sent. A grid will contain a listing for each email recipient of the monitor showing the successful sending of the email, an email that wasn't sent because it was outside the notification hours configured, or a email that failed to send for some reason such as an invalid recipient. You may delete the monitor history if you no longer wish to view it. You may not delete the history for an actively running monitor. We have made it easy to clone an existing monitor. Simply select the corresponding icon in the 'Create Duplicate' column in the list of available monitors. All the settings, selected managed instances, events, notification hours, and email recipients from the selected monitor will be copied to a new monitor definition. This makes setting up monitors for shifts much easier; the events and other setup need not be configured multiple times. Hopefully you see that setting up and using monitors in Server Manager is much easier than previous solutions and the added events make administering your E1 servers much easier. Dig in, play with monitors, and enjoy. UPDATE: I think the issue with missing images has been resolved. Unless you are running an E1 enterprise server on an NFS partition on the AIX platform, you can probably skip this posting. Still here? Ok. This post outlines a potential problem with changing the tools release of an enterprise server when it is running on a NFS partition on AIX. It pertains to that combination only. The AIX operating system has a feature that keeps shared libraries in memory even when the program that loads them terminates. Subsequent loads of that or any other program using the same library would be faster because the library is already in memory. This behavior can cause some problems when the shared library is located on an NFS partition. Consider the case when Server Manager is performing a tools change for an enterprise server. The management agent will 1) stop the enterprise server, 2) delete the existing tools release, 3) extract and replace it with the new tools release. So where's the problem? After stopping the enterprise server the E1 shared libraries may be cached by AIX even though no active processes are using them. AIX maintains open file handle to the shared library. On UNIX based platforms you are able to delete a file that is open by another process; although it will immediately disappear from the file system directory listings it will not actually be removed once the last handle to that file is closed. This behavior is done within the filesystem implementation. The remote nature of the NFS file system requires a special implementation. When an open file is deleted on a NFS partition it will appear as a .nfs##### file in the same directory, where #### refers to a number randomly assigned. This file cannot be removed directly; it will disappear as soon as the last process holding the originally deleted file closes that handle. So what does this have to do with E1 and Server Manager? The second step of performing a tools release change involves deleting the existing tools release. The caching of the shared libraries, and thus the presence of the .nfs#### files in the $EVRHOME/system/lib directories will prevent the removal of the system directory. This will cause the tools release change to fail, and the previous tools release will be restored. Even root cannot delete this .nfs files directly. What can be done is to stop the enterprise server using Server Manager then sign on as root and run the command 'slibclean'. This will instruct AIX to unload/uncache any shared libraries that are no longer being used by an active process. You may then change the tools release using Server Manager without any issue. If you navigate to the 'Managed Software' page in the quick links you'll see a listing of all the tools releases and JDBC drivers that have been uploaded to the management console. These packages, obtained from the Update Center, are used to stage tools releases prior to installing or upgrading them. You may notice an entry named 'Agent Install Pack 7' of type 'Management Agent Installer Bundle'. What is this? Well, in a previous post I mentioned that we have two separate downloads for Server Manager for each tools release. The large installer is used the first time you install SM. This includes the J2EE container used to run the web application, the SM management console application, and the corresponding agent install pack. The SM update contains only updated SM management console (and corresponding management agent code). Installing a new SM application and later applying an update is functionally equivalent to initially installing the later release using the installer. Our goal here was to keep updates small and easy to apply. There's actually a third possible download from the update center: a new agent update pack. This contains items that are rarely going to change with each tools release update. Specifically it contains the platform specific managed home installer for all the platforms we support and the platform specific Oracle Configuration Manager agent that is installed along with the managed home. So why the potential separate download for the management agent pack? In the event we need to update either the managed home installer or OCM agent that is initially installed we will create a new management agent pack that can be downloaded from the Update Center. Why would we do this? It won't be typical, but an example in which we might need to update the pack is if we added support for a new platform that isn't currently available or need to deploy code fixes to the managed home installer. As of this posting we have no foreseeable need to update the agent installer pack. In this case you will be instructed to download the corresponding agent installer pack and add it to the SM software repository. What if I delete the existing agent installer pack? This software component is treated just like any other software component; that is you can delete it either through SM or directly from the file system. If you have deleted the agent installer pack and navigate to the 'Management Agents' screen you will be instructed to obtain the installer pack from the Update Center. Since we have not had the need to rev the installer pack it is not currently available for download from the Update Center. So, in the case you accidentally deleted the existing installer package you may obtain it only by performing a new SM installation and copying/uploading the file from the new install to the existing installation. After doing so you may uninstall the new SM console just installed. The file will be named something along the lines of agentPackage7.jar and will be located in the directory INSTALL_BASE/components, where INSTALL_BASE refers to the installation path of the SM application. Starting and stopping an enterprise servers is an easy task. Start the appropriate service on Windows, run STRNET in the appropriate system library on iSeries, and execute the RunOneWorld.sh script on UNIX based platforms. Simple enough, right? While the first two examples are as easy as they sound configuring the proper environment in order to start the UNIX based servers has become an art form of its own. This article while detail the steps, fixes, and other details on how Server Manager starts the enterprise server on UNIX based platforms. The various install permutations of apps releases and introduction of the platform pack have resulted in different environments for the UNIX servers. Prior to 8.11SP1 an installer was used to install the enterprise server code. This installer created a script, named .oneworld, in the operating system user's home directory and modified the user's .profile to call this script. The .oneworld script defined several environment variables used by the RunOneWorld.sh and other scripts including the EVRHOME and SYSTEM variables. These environment variables must be properly set in order for the startup scripts to operate properly. The $EVRHOME environment variable refers to the installation path of the enterprise server. Underneath this directory would be, among other things, the pathcodes and system directory containing the tools release. The user's .profile was modified to call the enterpriseone.sh script during login. Since Server Manager supports all application releases from 8.9 through 8.12 the startup and shutdown logic must accommodate both of these conventions. In all cases the corresponding environment setup script (.oneworld or enterpriseone.sh) must be called prior to calling RunOneWorld.sh or EndOneWorld.sh. The 8.97.0.0 release of Server Manager contained several issues around properly setting up the environment prior to invoking the start/stop scripts. Most of these issues have been addressed by 8.97.0.1 and as such all UNIX based installations should immediately upgrade server manager to 8.97.0.1. Including the appropriate environment scripts resolved most of the startup issues discovered. There remains one pending issue for IBM UDB users: prior to 8.11SP1 the installation instructions required the user to add a call to the db2profile script used to setup the environment needed for the UDB binaries and environment variables. The documentation instructed the user to add this call to the operating system user's .profile. The startEntServer.sh/stopEntServer.sh scripts did not directly include the db2profile script call, resulting in an enterprise server started using server manager failing to connect to UDB. The jde.log files for the kernel processes that establish a database connection would include numerous errors indicating that libodbc. [sl or so, depending on platform] failed to load. The next tools release will include some fixes to address the UDB issue mentioned above. As the startEntServer.sh and stopEntServer.sh files are created, during start or shutdown, the management agent will parse the user's .profile looking for a call to the db2profile script. If found it will add a call to this script thus properly setting up the UDB environment. If you are using 8.97.0.1 Server Manager in a UDB environment you can easily workaround this issue by adding a call to the db2profile into the .oneworld script rather than the .profile. Depending on how the user is setup, how the db2profile script is called, and the virtually unlimited permutations we realize that our .profile parsing logic may not always find the db2profile script. There may also be other environment setup that we did not anticipate. Since the startEntServer.sh and stopEntServer.sh scripts are dynamically created it is not possible to modify these files directly. To address this a check for the scripts startExtras.sh or stopExtras.sh has been added to the dynamically created scripts. We do not deliver these scripts, however, if present they will be invoked. This permits the administrator to add any additional setup each time the server is started or stopped. These scripts are located in $EVRHOME/SharedScripts and are available for all apps releases. The 8.96 tools release introduced Java based kernel processes using a bundled JVM for the metadata kernel. 8.97 makes further use of this capability for both the BI Publisher and Server Manager kernel processes. The required JVM is bundled with the tools release (except iSeries where it is built-in to the OS). 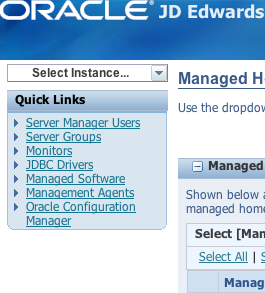 The server manager managed home agent also includes a bundled JVM (again, except for iSeries). The 8.12 platform pack (and the included enterpriseone.sh) shell script properly configures the LD_LIBRARY_PATH or SHLIB_PATH (depending on platform) to properly define the directories in which shared libraries should be loaded. The scripts created by the installers/platform packs prior to 8.12 did not have these additional environment configuration parameters needed to properly startup the enterprise server. With Server Manager the startup scripts are invoked by a Java process (our bundled JVM, based on 1.5). The JVM will modify the LD_LIBRARY_PATH or SHLIB_PATH to include locations specific to the 1.5 based JDK we deliver. This will conflict with the 1.4 JDKs delivered with the enterprise server tools release. If you installed your enterprise server using the 8.12 or later platform pack stop reading; this issue will not affect you. If you initially registered your enterprise server using the 8.97.0.2 release or later stop reading; we have fixed the issue. If you installed your enterprise server using 8.11SP1 or earlier AND registered your enterprise server using 8.97.0.1 or earlier server manager you may still have an issue. We modified, during the registration process, the .oneworld or enterpriseone.sh script to properly setup the LD_LIBRARY_PATH/SHLIB_PATH for you. However, there was a flaw that you may have to manually correct. If you look in these files you will see a line that was added by server manager that defines the JVM_LIB environment variable, and the LD_LIBRARY_PATH/SHLIB_PATH are modified to include it. The flaw, however, is in the order added. We appended the JVM_LIB environment variable to the existing LD_LIBRARY_PATH/SHLIB_PATH. Instead it should have been prepended to it. If you registered your enterprise server using 8.97.0.2 or later server manager don't worry -- all these issues have been resolved. If you registered your enterprise server using 8.97.0.1 or earlier server manager and your enterprise server was installed using 8.11SP1 or earlier platform pack/installer you may need to modify the LD_LIBRARY_PATH/SHLIB_PATH to move the JVM_LIB definition. If you use UDB and you are using 8.97.0.1 or earlier server manager and your enterprise server was installed using the 8.11 or earlier installer you may need to add a call to db2profile to the .oneworld shell script. An issue has been discovered that prevents the successful installation of Server Manager when the user that performs the installation is configured for something other than English. The problem relates around messages that are output by the embedded container. The installer is looking for particular words, in English, and the container is outputing that text localized. So even though the installation was successful the installer thinks it failed and begins to uninstall. A workaround is to change the current user's language, in Windows, back to English and perform the installation. Also make sure the 'Language for non-Unicode programs' on the advanced tab is configured to English as well. These settings can be found in the 'Regional and Language Options' control panel option in Windows. Once the installation is complete you may return to using the desired language of choice. Tools release 8.97 adds two new kernel definitions to the enterprise server: the BI Publisher (XML Publisher) and Server Manager kernels. Like the metadata kernel introduced in 8.96 these new kernels are Java based kernels that start their own JVM instance to run Java code rather than the traditional C based code of kernels past. SM will automatically add and configure these kernels into the JDE.INI when changing the tools release to 8.97. This post will focus on the server manager kernel. The server manager kernel (number 32 for those keeping count) operates on all platforms and loads a JVM upon startup. This JVM will in turn load the management agent. This is the same codebase as that used by the managed home agent and is used to provide runtime information about the enterprise server to the management console. It uses a couple of INI settings, configured automatically, to provide it with the instance name and managed home location associated with the enterprise server instance. From the managed home location it will read the agent.properties discussed in previous posts to obtain the connection details for the management console. It also follows the same connection logic used to establish communications as outlined in that post. The management console uses this kernel to obtain all the runtime information about the server such as the active process list. It also uses this agent to expose and provide the log files that are active for the processes that appear in the process list. This kernel definition is a singleton; that is there may only be a single process active and must be configured to start automatically, again all configured automatically. In fact the management console will not permit configuring more than one process for this kernel. The underlying network communications used by the management agents is different than the JDENET communications used by other kernels. As such the singleton can properly handle any amount of load and introducing additional processes is not necessary and will cause unexpected results. The Although SAW has been replaced with 8.97 there are still portions of the SAW infrastructure that are used by server manager. On the enterprise server the SAW kernel is still used. The Management Kernel (Java) exposes the runtime information using the JMX standard. It obtains much of this information by sending JDENET messages to the SAW kernel. It is advisable to continue to run multiple SAW processes. The information exposed by the management kernel is collected periodically, approximately every 30 seconds. After that elapsed time JDENET messages are sent to the SAW kernels to collect the information. Having multiple SAW kernels will ensure that the information update to the management kernel occurs quickly and reduces the likelihood of any of these messages timing out. In reality there is very little that needs to be known about this kernel. That said if the runtime information isn't available for a running enterprise server it may be desirable to investigate the log files for the kernel. There are two sets of log files of interest: the jde/jdedebug.log and the java log files. The first place to check is the server manager jde.log. Since the process list isn't available (that's what we're troubleshooting) we'll have to randomly go through the log files exposed on the management page for the enterprise server until we find the management kernel. A successful startup is shown below. If there are any errors about starting up the JVM, loading the SM classes, or any other content in this log file this is the first place to look. The management kernel provides server manager powerful new monitoring capabilities. The operation of the management kernel can generally be ignored and should only be of concern should runtime information not be available for a particular enterprise server in the management console web application. Although this isn't a Server Manager specific post the SM tool may provide insight into the database connection pooling behavior. The EnterpriseOne web based servers maintain a pool of connections to a database. When a database connection is required it will be obtained from the connection pool. When no longer used it will be returned to the pool. The maximum size, initial size, growth increment, and other parameters are configured in the JDBJ Database Configuration -> JDBj Connection Pools configuration parameters. Refer to the Server Manager Guide for information about the particular settings. For each effective database connection, or connection URL, a pool of connections is created upon first request. What is a connection URL? The actual logic varies based on database type but can be summarized as a combination of the connection information (server, port, SID, etc) appended by the name of the proxy database user. A good way to think of it is evaluating the actual connection details defined by an EnterpriseOne datasource. For example a typical Oracle database based installation will use the same SID for each datasource. Thus regardless of whether the datasource is 'System - 812' or 'Central Objects - PD812' it all boils down to the same database -- the SID. In this case the connection URL will be the concatenation of the SID with the name of the proxy user. Other databases may use more complex naming conventions for the connection URL. For example SQL Server based datasources will look something like 'jdbc:sqlserver://DENDSQWN01:1433_JDE_DEVELOPMENT_true_JDE'. This URL includes the server name, listening port, physical database name, unicode enabled, and proxy user. The active database connections may be viewed using Server Manager. Navigate to the HTML server of intesrest and select 'JDBj Connection Caches' from the runtime metrics. You will see all the connection pools that have been established. In the screen shot above you can see I actually have two sets of 10 database connections to two different connection URLs. The thing is these are the same database differing only by case. This didn't seem like a good thing so I went through my database datasources (F98611) and found I used all upper case there. I then went through the configuration metrics in server manager for my JAS server and found both upper and lower case uses of the Oracle SID. Changing those all to uppercase and restarting my server resulted in a single pool to the database. It may be advantageous, performance-wise, to configure multiple JVMs to run a single JAS instance rather than a single, larger JVM. Server Manager has made it easy to configure and utilize multiple JVMs and enhancements in the 8.97 tools release ensure there are no conflicts with log files. A multi-JVM configuration allows a single URL to be load balanced onto two or more JVM processes for a single OC4J container. The Apache http server will automatically load balance users onto a particular JVM where their session will remain for the duration of their sign-in. A multi-JVM setup is not a failover clustering configuration; that is, if a JVM were to crash all the user sessions on that JVM will also terminate. 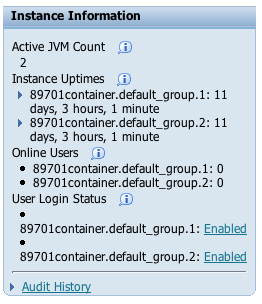 The number of simultaneous JVMs is configured at the OC4J container level. To view or modify the JVM count navigate to the management page for the Oracle Application Server within Server Manager. In the middle of the page you will see a section listing each J2EE container (OC4J instance) within the OAS instance. Listed next to each OC4J instance is the JVM Processes edit and a list of active JVMs if the container is currently running. To modify the JVM processes edit and save the change. Changes will take effect the next time the container is started. Starting or stopping a JAS instance within server manager starts/stops the corresponding container. Server Manager will automatically detect the multi-JVM configuration and display all the runtime metrics (user sessions, database caches, et. al) separately for each JVM. Each JVM is assigned, by OAS, a unique JVM identifier. This ID is in the format container_name.group_name.index, where container_name is the name of the OC4J instance, group_name is the name of the OAS defined group to which the container belongs, and index is an integer beginning with 1 and incremented for each JVM started. Each JVM will utilize the same configuration files. As such it is not necessary to configure items for each JVM. In fact, it is not possible to configure items separately for each JVM. Multiple JVM configuration is supported only for the EnterpriseOne HTML (JAS) server. Configuring multiple JVMs for the other E1 web products, such as the Transaction Server, PIMSync Server, or Business Services Server is not supported and may cause unpredictable results. While playing around with this I discovered that making changes to the JVM count on a running container will take effect immediately. That is if you have a container that is configured for a single JVM and change the value to 3 you will see two more java processes appear (after a few minutes). Changing this back to 1 will shut down the additional JVMs. Note: I do not know if it will shut down JVMs with active users on it. This is pretty cool and can be used to aid a HTML server that is getting overloaded without having to restart it. A powerful feature of Server Manager is the template configurations defined for each server type within a server group. Properly configuring the server group template greatly simplifies the creation of a new HTML server. When the server is created it will copy the configuration defined for the server group selected thus requiring minimal, if any, configuration during deployment. JDBJ Database Configuration -> JDBj Bootstrap Datasource - Configure this section to point to the location of the system tables (e.g. System - 812). You can find these values in the JDE.INI of a development client. JDBJ Database Configuration -> Oracle Database Settings -> File Contents - If you are using an Oracle database cut and paste the contents of the TNSNAMES.ORA that the server should use. There are many other options that may be configured; however, these are the core values I always configure. Properly configuring the server group once significantly simplifies the new creation of servers at a later time. One last note: when a new server group is created the template configuration is copied from the default server group. Configuring the default server group prior to creating additional server groups means you don't have to reconfigure these items for each new group unless a change to these particular settings is required. Here's a real quick one: I was asked today if it is possible to know who all is signed in to the management console. To see this simply navigate to the management console instance (Instance Name: home) and select the 'User Sessions' runtime metric on the left. You'll see a grid containing all the active management console users. Your current session will be highlighted in bold. The managed home agents communicate with the management console using secure JMX connections. Once started the agent will connect with the console, perform some registration tasks, and appear automatically in the management dashboard. This article provides inside to the communication process and steps to troubleshoot the communications. The management console is configured with a JMX port used to establish communication between the management agents (both the managed home agent and the embedded agent contained within the server products). This port is specified during the installation wizard and defaults to 14501. When the agent is installed a configuration file containing the name of the management console and JMX port to use is configured. This is in the file install_location/config/agent.properties. The name of the server may either be a short machine name, a fully qualified domain name, or an IP address depending on how the Java process running the management console was able to resolve the host name. If the connection could not be established a corresponding error will appear shortly in the log file. On the machine the agent was installed attempt to ping the management console using the server name configured in the agent.properties file. If the ping is not successful you may either change the agent.properties file (for example to not use a fully qualified name) or modify host files (e.g. /etc/hosts on unix) as necessary. Either way restart the agent after making any changes. If the ping was successful you can attempt to telnet to the management console using the same port. For example 'telnet denlcmwn5.mlab.jdedwards.com 18501'. If the connection is successful you know the agent is able to establish a connection to the console. If this fails there may be firewall or other networking issues preventing the connection that need to be resolved. Note: On a successful connection you may ignore any content displayed in the connection; it will not be human readable. Once that connection has been made the management console will assign a TCP/IP port that the agent should use to listen for incoming connections. The agent will pass in it's machine name and install location, and the console will provide the next unused TCP/IP port starting at the 'Management Agent Starting Port' which was also configured during the installation wizard and defaults to 14502. INFO: Starting the management agent listener on port '18607'. If the operation was successful, as shown above, you may continue to to the next step. If there are errors indicating the listener could not be started you should make sure no other program is using that same port (and if they are you may change the 'Management Agent Starting Port' to something else in the management console (Select the 'Management Agents' link in the Quick Links. Do not change the 'Management Server JMX Port' setting. Next you will see an entry about the calculated port discussed above. FINER: Determining the port the remote agent 'denlcmlx2' should start listening on. FINER: Assigning the port 18607 to the remote agent 'denlcmlx2'. FINE: Attemping to establish a connection from the management console to the remote agent 'denlcmlx2' on port 18607. FINE: Successfully established a connection from the management console to the remote agent 'denlcmlx2' on port 18607 with connection id 'jmxmp://10.139.163.53:3213 32330841. This completes the communication negotiation process and the managed home will soon appear in the dashboard. On the management console machine ping the server using the name reported in the log files (in this case denlcmlx2). If not successful ensure the network/dns configuration is correct. Add an entry to the hosts file (\windows\system32\drivers\etc\hosts) for the machine name if necessary. If the ping was successful telnet from the management console to the specified name and port, for example 'telnet denlcmlx2 18607'. If that connection was not successful ensure that there are no firewall or other networking issues preventing the connection. Nearly all the problems related to the managed agents not appearing in the management dashboard are related to networking and host name resolution issues or firewalls that are in place between the server running the management console and the remote machine. On the iSeries platforms if there are errors in the logs indicating crypto or encryption related problems (because the connection between agents is fully encrypted) this usually indicates the required JDK (1.5) is not present. Server Manager is mastered along the standard tools release schedule. That means that for each tools release, maintenance release, and update will include downloads for Server Manager. For each tools release there will be two downloads. If you are installing SM for the first time I would recommend obtaining the latest installer. This will be a large (1 GB) download that is used to perform the initial installation. If you have already installed SM you may download a significantly smaller update (around 30-50 MB) and apply that to your existing SM installation (of course using SM to perform the update). For example installing 8.97.0.0 and then applying the 8.97.0.1 update will be functionally identical to initially installing the 8.97.0.1 release. You may also go backwards, if desired, to an earlier release. Remember you may always use the latest SM release even if you are managing earlier tools releases of the E1 components. Using the latest SM release ensures you have all the latest bug fixes and functionality available. I and some of my colleagues will be OpenWorld this year. Visit us at the EnterpriseOne Tools and Technology booths at DEMOgrounds and attend Server Manager session on Thursday morning. See you there!